Jan 8, breakfast. The usual. January 8, lunch. 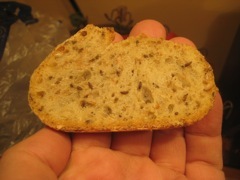 Beyond Bread sandwich. In Tucson, with Jan.
January 8, dinner. At Zemam's with Jan, Mark, and Rose. January 8, dinner. 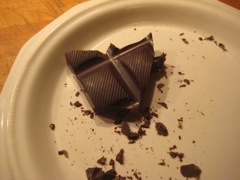 After Zemam's, we went back to our place and had some chocolate. January 9, breakfast. The usual. January 9, lunch. 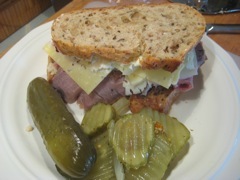 Roast beef sandwich, with cheddar cheese, horseradish sauce, sweet and sour pickles, on Beyond Bread rustic rye bread. At home with Jan.
January 9, dinner. Ted & Barb's Chili and Eggnog party. Lots of different types of chili with a wide variety of treats. 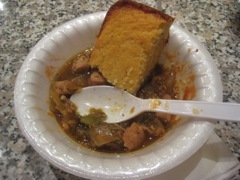 This was green chili of excellent flavoring. January 9, dinner. At Ted & Barb's Chili and Eggnog party. Dessert! January 10, breakfast. The usual. January 10, lunch. 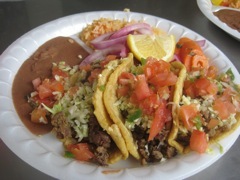 At Taqueria Pico de Gallo on South 6th Avenue in South Tucson. Two pork tacos, rice and beans. Very, very good at an outstanding price. Possibly the best taqueria in Tucson now that Lupita's has closed. With Jan on the way to the airport. January 10, dinner. At North in Tucson with my mom. 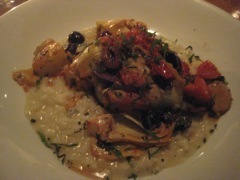 This is a chicken artichoke thing they came up with, served on risotto. 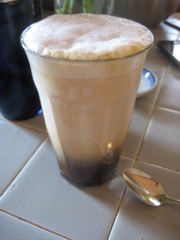 It had nice flavor at each layer. January 11, breakfast. 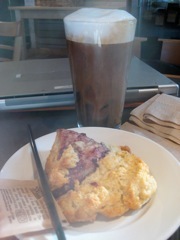 Iced double cappuccino and a raspberry scone at Raging Sage in Tucson. 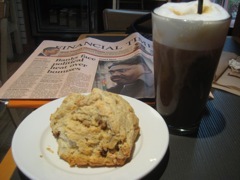 I have breakfast here when Jan is out of town because it gives me a nice time to work without interruption and also because the scones are really really good and the coffee is not bad at all. January 11, snack. 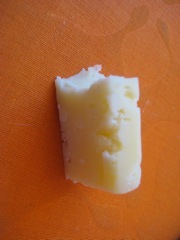 A bite of aged manchego cheese. In the office. January 11, lunch. 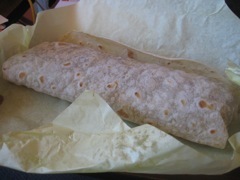 A shrimp burrito from Nico's Taco Shop in Tucson. In the office take-out. January 11, dinner. 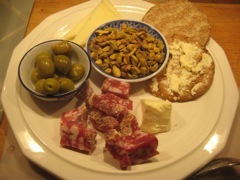 Grazing plate: some tallegio cheese on crackers, bits of salame, a few manzanilla olives, some pistachios, and a few bites of aged Spanish manchego cheese. Plus some Turley 2001 Zinfandel. At home in Tucson. January 11, dinner. 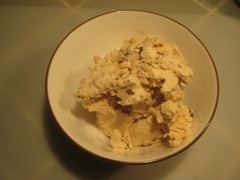 Dessert of Penn State Creamery ice cream, coffee. 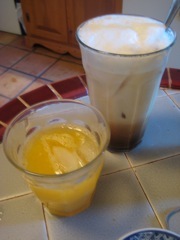 January 12, breakfast. At Raging Sage in Tucson. 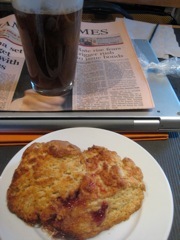 A raspberry jam scone and an iced double cappuccino. January 12, lunch. At Nico's Taco Shop with Don and Barbara. 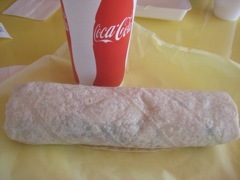 I had a carnitas pork burrito and a coke. January 12, snack. 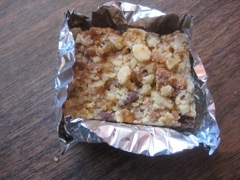 A Barbara Ann Bomb, chocolate/coconut/nut bars cut into little squares. She makes them every year and sends them out as Christmas presents. This is probably the last one. Still good. January 12, dinner. 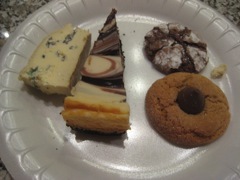 Grazing plate. 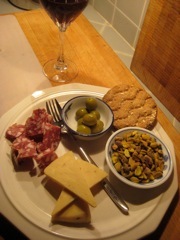 Salami, cheese, cracker, lots of pistachios from that really good grocery store in Berkeley, California, and some olives. At home. January 12, dinner. 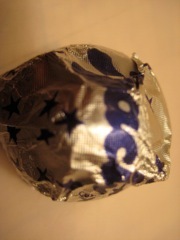 Un bacio per dolce. Mmmm. Chocolate and hazelnut. January 13, breakfast. 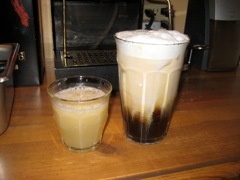 Iced cappuccino and a fig/nut scone at Raging Sage in Tucson. January 13, lunch. 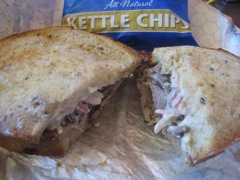 Baggins' new French Dip sandwich. 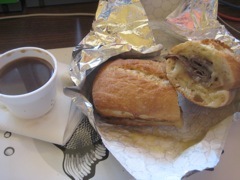 A traditional french dip (assuming that a traditional one includes cheese) and the au jus. This was new for them and a lot of work to put together because of the au jus. Still, good. I think, though, that the idea of dipping your sandwich as you go on is probably counter to the take-out philosophy. So I predict this one, good as it is, won't really win. January 13, lunch. 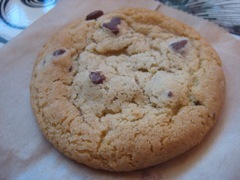 A cookie. From Baggins in Tucson. At my desk. January 13, dinner. Grazing plate at home. 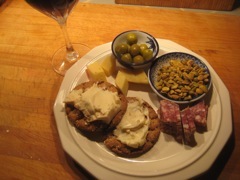 Crackers with Tallegio, salami, pistachios, olives, and some St. Andre and Cheddar cheese. January 14, breakfast. 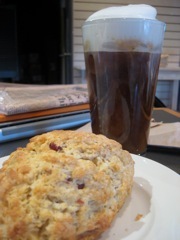 Iced medium cappuccino and a dried cranberry scone at Raging Sage in Tucson. January 14, lunch. Baggins Almost Reuben. Good example of the genre, but not really New York style. Tuned down for a normal lunch. In Tucson. January 14, dinner. 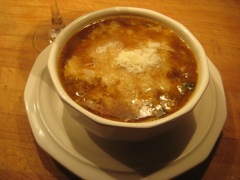 Bowl of Joel's French Onion soup, with cheese on top. And a glass of Zinfandel. At home. January 15, breakfast. 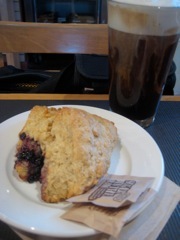 Iced medium cappuccino and a blackberry scone at Raging Sage in Tucson. January 15, lunch. 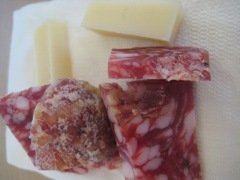 Just a few bites of salami and cheese.